700 series syringe barrel components are compatible with all air powered dispensers, syringe guns or our hand plunger rods. These high quality barrels are suitable for use with most fluids from watery liquids to thick pastes. In sizes 3cc, 5cc, 10cc, 30cc, 55cc and in natural (clear), amber (UV tint) and black (UV block). 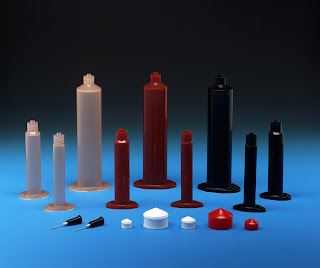 700 series air-powered barrels are safe to 100 psi and are certified silicone free. Barrels are available with a range of wiper pistons, air adapter assemblies, o-rings, cap seals and accessories.